We’re going to be really honest: we believe in ghosts. We also refuse to believe that ghosts and supernatural activity just stopped after the ending of Ghostbusters films. Did Venkman, Egon, Ray, and Winston just up and retire? We haven't heard anything in awhile, which makes us worry. It’s also awful timing since we are almost 100% positive that there is a ghost living in our office’s copy room. Sometimes, when we walk by, we can see a faint green glow, and sometimes when we’re in there, the hairs on the back of our neck stand up and it feels like someone is watching us as we scan something. Sometimes we're positive we've chosen the LETTER tray but it comes out on LEGAL paper. Also, and this part is the weirdest--we never get paper jams. Sometimes things kind of hiccup, but then a few knobs on the machine will turn on their own and the copying continues flawlessly. So it appears to be a slightly helpful ghost at this point, but still, we’d love to know someone is out there if we wanted to, you know, call. 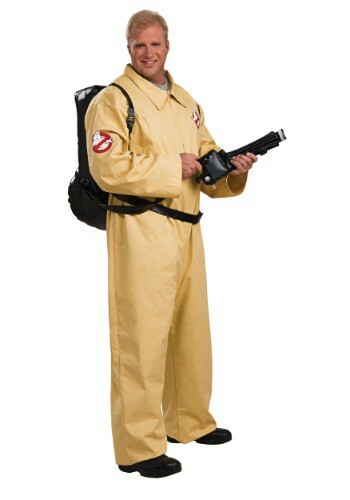 So how about you suit up into this Plus Size Deluxe Ghostbusters Costume and join the ranks? You can begin taking care of any paranormal activity almost the moment you put on this officially licensed look. The jumpsuit is the iconic version from the films and the proton pack inflates to make you appear unstoppable against otherworldly mischief (which we sincerely hope you are). We’re glad to to know you’re on the case; in case our little friend stops helping repair the copier and starts, oh, using the ink for finger painting.